You guessed it. 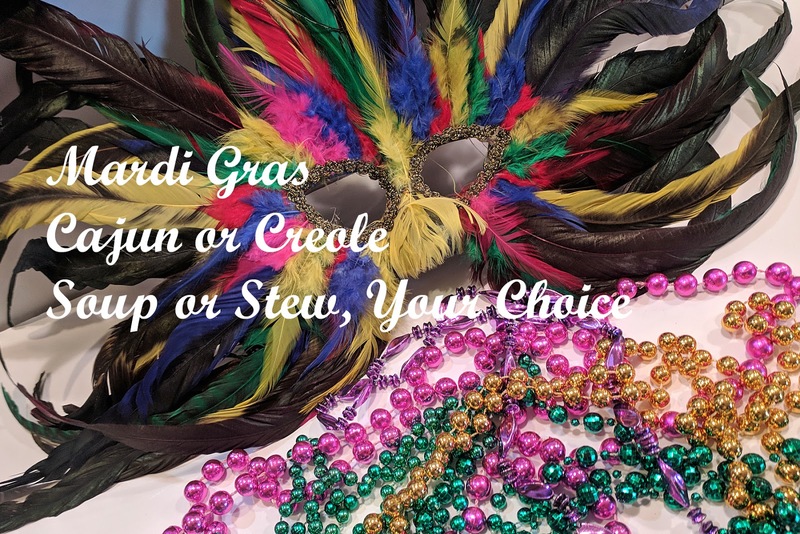 This month's theme for Saturday Soup Swappers is Mardi Gras - Cajun or Creole. It begs for a celebration, doesn't it? I had to really think on this one. I love the flavors of Cajun and Creole foods but having to narrow it down to one....tough to do. Being a seafood lover I looked longingly at Creole Bouillabaissse and at a Corn and Crab Bisque....and I will probably make those but for this post I found myself leaning in a totally different direction. Louisiana's history and economy find sugar playing an integral part. And, sugar means dessert, so for this post I am presenting a Chocolate Soup with Caramelized Bananas! The desserts in Cajun and Creole kitchens are variations of the Old Country: Germany, France, England Spain and Italy. Those are a lot of influences. I couldn't help but step out of the box just a bit when I read about this soup dessert! 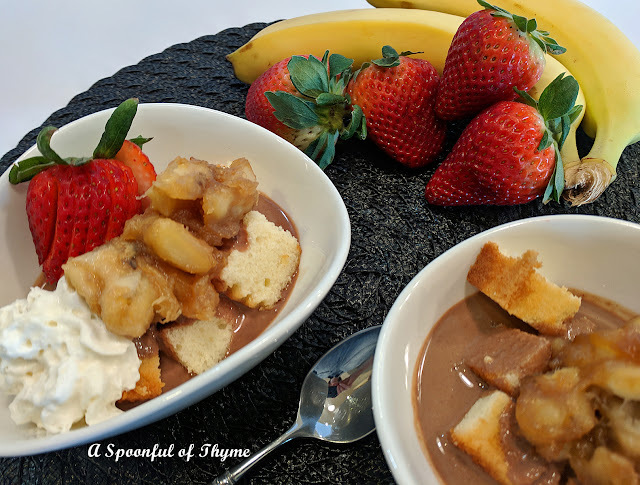 Let's face it, I was envisioning Bananas Foster...I will do anything for Bananas Foster, even mix chocolate and fruit which is something that I do not do...(the two flavors together are not on my list of favorites) So, unless I have to, I don't....and I guess I just had to this time. Over medium low heat, cook the chocolate, half and half and the sugar in a medium saucepan until the chocolate melts and the sugar dissolves. In a stainless steel mixing bowl whisk the egg yolks. Add one cup of the chocolate mixture to the eggs and whisk. Slowly add the egg mixture to the pot of chocolate, stir frequently. Remove the mixture from the heat and stir in the liqueurs. At this point the mixture may be refrigerated for two hours or up to five days. Before serving reheat the mixture in a double boiler, whisking constantly. In a mixing bowl, toss the bananas and rum. 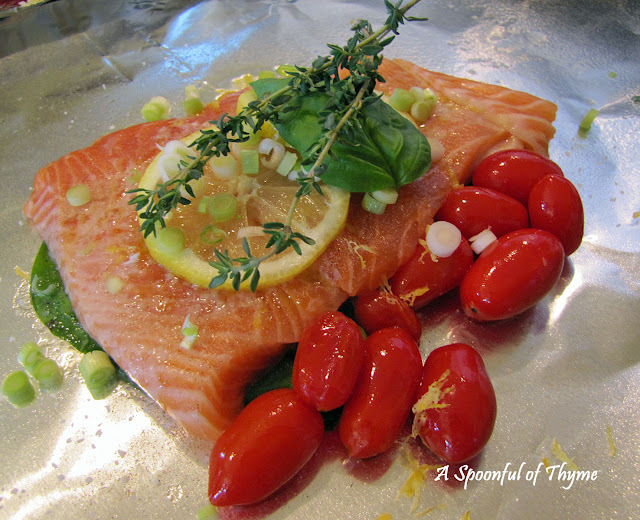 Set aside at room temperature for 20 minutes. Melt the sugar in a skillet over medium high heat, until golden brown. Remove from heat and add the butter. Stir the mixture until smooth. Add the bananas and rum. Return the skillet to medium high heat. (Watch closely as the rum may ignite.) Continue to cook the bananas until most of the liquid has evaporated. The bananas should be soft but not mushy. Remove them from the heat and pour onto a plate. Cover them with plastic wrap and allow to sit for 20 minutes. To serve, place the pound cake cubes in small bowls. Ladle about 1/2 cup warm chocolate soup over the cake. 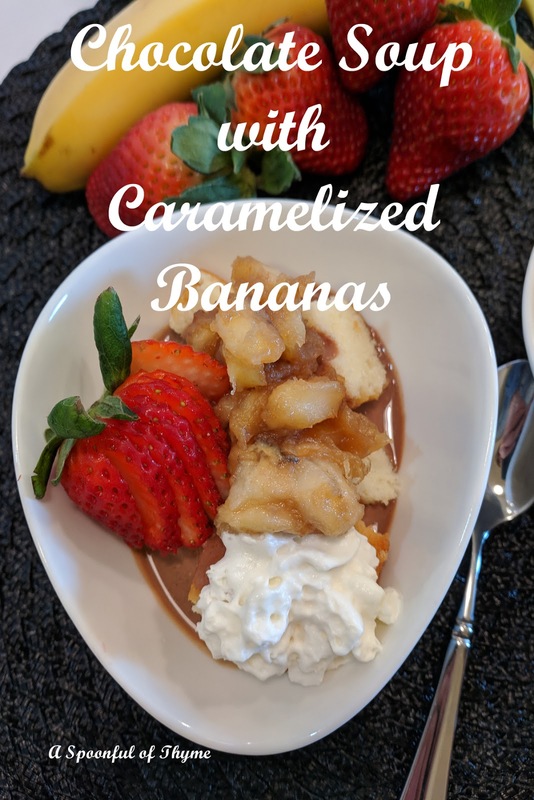 Garnish with the bananas and a dollop of whipped cream. I think I was expecting bananas foster. This wasn't that. There was no cinnamon! It wasn't overly sweet, the chocolate was really smooth with a hint of liqueur, and...warm chocolate soup, yep, that was it...pretty tasty!